WPC 20 is Here! Register Now! WPC 20: Understanding, Respecting, & Connecting! March 20th – March 23rd, 2019 in Cedar Rapids, Iowa. Registration information at WPC 20. Read More Read more about WPC 20 is Here! Register Now! Click the hyperlink "More.." to your right to view more information. Start the New Year with a pledge to support the publication, management, and accessibility of Understanding & Dismantling Privilege through monthly donations to our primary source of funding,The Privilege Institute (TPI). The journal of Understanding & Dismantling Privilege is seeking papers on the topic of race, racial oppression, and racial privilege that utilize Critical Content Analysis (CCA) as a methodological approach to research. For more information please contact Special Issue Co-Editors Jamie Utt at uttja@email.arizona.edu For a full description of the theme and deadlines for submission please click on the hyperlink "More..."
Every act of generosity counts, and each means even more when we give together. #GivingTuesday includes people of all races, ethnicities, religions, and backgrounds. This year consider making a meaningful donation to The Privilege Institute (TPI), this can be done by making a tax deductible donation, volunteering/sponsoring WPC, and more. Click on this Announcement to learn more on ways to support the White Privilege Conference. Special Issue is Almost Here! The UDP is excited to announce our Special Issue in partnership with Brock University is to be published soon. If you have not signed up to receive notifications of our publications, then please register here on our online system. Read More Read more about Special Issue is Almost Here! 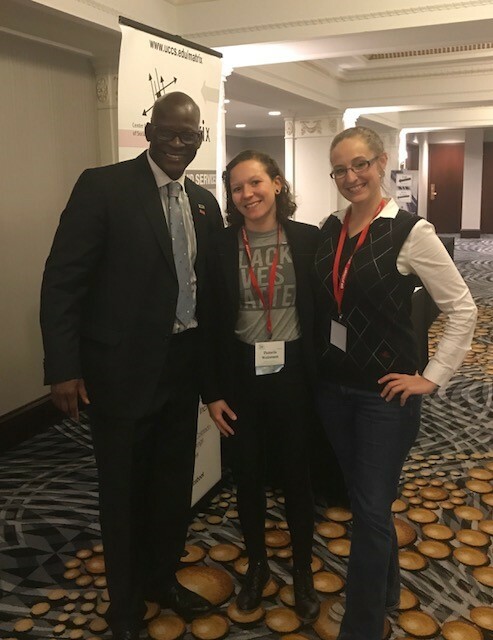 Eddie Moore, Jr., Pamela Weismen (Matrix Center Manager), and Sarah Mayer (UDP Journal Manager) at the Journal and Matrix Center Exhibit at the 2017 WPC! Thank you for everyone who came by to say "hi"
Online-Registration is now closed. You can register in person at the conference. For additional information on registration options (one-days and/or groups) and pricing, as well as ordering tickets for the Community Dinner, click the hyperlink "More..." next to this announcement. Final schedule for WPC is available. Click the hyperlink "More" to view, and/or use the following link to download and print. For detailed information click on the hyperlink "More"
UDP now accepts submissions whose content challenges or advocates previously published UDP work. UDP has extended its deadline for accepting submissions for the Spring 2017 publication to January 14th, 2017. Submission Guidelines and Polices can be found under ABOUT on our main running bar. For futher information on the importance of this extended deadline please read the below description under "More..." Read More Read more about Happy Holidays! Let your cheer and work shine! The journal is currently accepting submissions for our Spring 2017 publication. For submission guidelines please click on the link "ABOUT" and if you have not already then enroll as an Author and/or Reader to submit your paper. We accept a wide variety of the style of work whether it is self-reflections of teachers, college student papers on social justice, or academic research. For more information contact our Journal Manager at smayer2@uccs.edu Read More Read more about Submit your papers! The White Privilege Symposium-Canada, Brock University is calling for papers under the theme: “Academics & Activists: Advocating for Equity, Justice and Action." Summer is Here: Send in Your Written Work! Take advantage of the summer, and send in a submission! We accept creative work, such as testimonies and reflections from the White Privilege Conference, as well as tools and strategies, research, youth and student voices. If you or someone you know has written something that would fit with our mission, then encourage them to submit! Read More Read more about Summer is Here: Send in Your Written Work! Interested in Serving as a Reviewer? Attending the 2016 WPC? Then join our leadership information session to learn more on serving as a UDP Reviewer. Read More Read more about Interested in Serving as a Reviewer?